The journey called high school ends here. This is the time where many young people are waiting anxiously for their final results, to know your fate. Some will receive great news and some will not. Passing matric is one of the biggest milestones one can achieve. Those who made it should be proud of the hard work that they put in throughout the year and the entire schooling career. However, failure does not mean defeat. Life is full of challenges and knocks, instead of a fail getting you down, let it give you direction. Let this be a lesson and see this as an opportunity to do better. Do not let the disappointment consume you, let it build and encourage you to get up and try again. There are other options available if you are willing to put in the hard work and better your results. There will be an opportunity to write a supplementary exam between February and March 2013. Study harder and smarter and you will pass. Should you not qualify for a supplementary, it is alright to start over. 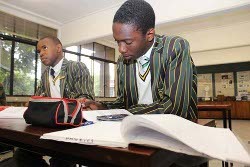 If you do not want to go back to the same school, private colleges offer the opportunity re-enrol and re-do your matric. CLICK HERE to read more on what possible options are available. This may seem like the end, it is not! You have to decide that this is your beginning. There is still a long way to go and after matric you will face the real world where you will experience challenges that sometimes will not seem fair. There are people who can help you get through this tough time. The South African Depression And Anxiety Group offers information and help. The Suicide Crisis Line 8am-8pm 0800 567 567 SMS 31393 or visit www.sadag.org Please remember that you are not alone and this is not the end.